The Front Lever is one of the most sought after Calisthenics moves, visually amazing it’s also one of the hardest static holds to attain. For many like the Planche it can easily become the ‘White Whale’. Today I’m going to give you a few helpful tips and exercises that will help along the journey to getting that elusive Front Lever. I’m not going to talk at length about all of the various leg positions that you can adopt to train the static holds as they are widely available on the internet and if you are one of my students then you’ll already be aware of what they are. 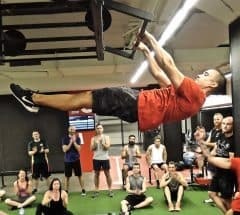 Instead I’m going to talk about some other subtleties and exercises that will assist in that each for the Front Lever! The positioning of the hands in the Front Lever is incredibly important. Essentially when in the true Front Lever position the hands need to be located above the hips and the feeling should be of trying to pull the bar down to your hips. For this reason it’s vitally important that we get as much of our hand over the top of the bar as possible and we try to put as much tension into our grip as possible. It’s for this reason if I am using Rings I will actually use the False Grip while I am in my Front Lever, so I can apply as much downwards pressure as possible on the Rings which is easier when there is more of your hand and wrist in the Ring. The same idea can be applied to a bar as well. If we are not yet strong or mobile enough through the wrist to be able to use the False Grip whether it is on Rings or a Bar then we can still try to put tension through our grip by gripping hard, getting as much of the palm of our hand on the bar & pulling down hard on the ring or the bar. If using a bar then we should also attempt to twist or bend the bar with our hands. Obviously the bar will not bend but this will enable us to generate more tension. Bodyweight Strength training is all about Length and Leverage. It is the rule by which we make an exercise easier or progressively harder and when training any of the big static strength moves (think Back Levers, the Human Flag, Planche and the Front Lever) what we do with our leg length makes all of the difference. When we first start training the Front Lever whether we are going negatives from the top down or attempting static holds we should always start in the Tucked position, before moving into a more Open Tuck position and so forth. The Front Lever rely’s predominantly on the strength generated by our Lat’s, Scapula, the Rhomboids and the lower Traps. It’s absolutely necessary that we develop the strength in these areas, which is why we must keep our elbows locked, arms straight and attempt to pull through the large muscles of the back rather than attempting to use the smaller muscles such as the biceps to hold our entire bodyweight in a horizontal position. The abdominal or the core is used as the stabilising muscles that allows us to be at full length in the Front Lever position and it’s not the superficial muscles either it’s the deep core muscles that provide the stability. Henceforth regardless of how strong your back is we will also need to strengthen that core massively! 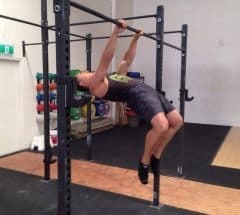 Which leads me to the next 2 exercises which are perhaps not as commonly used when we think of training the Front Lever, but I have found both of them to be hugely useful in developing strength in the right areas. In the Hanging Arched Pull we are trying to get as much of our chest facing up to the ceiling as possible. To do this we pull down and back through the shoulders, keeping our arms straight & leading backwards with the head thinking of trying to pull the scapula/shoulder blades together behind us. This position forces us to work on our retraction strength and engages all of the back muscles that we need in order to build strength for the Front Lever. Whilst the pulling is occurring through the back we will need to think about leaving our legs behind us so we pull our heels towards our glute’s and allow the arch to occur through our spine. In order to protect our lower back in this position we need to squeeze our glute’s. The reason I like this exercise for a supplementary exercise for the Front Lever is twofold. It enables us to focus on the pulling aspect of the movement which is helpful particularly when we are starting out with Body-weight training and also because we need to deal with the feeling of the legs trying to drag you back down as they are facing towards the floor. When most people first start doing this exercise the range of motion may not be great as it may feel like you are literally tilting your head back to face the ceiling. Over time like anything the strength will develop. This exercise can be done for reps or as a static hold, I would recommend trying both. 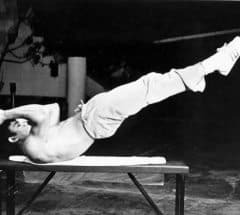 The Dragon Flag was Bruce Lee’s go to core strength exercise which probably says it all really. However to expand on this. The Dragon Flag is less about building pulling strength (though obviously there is an element of pulling strength required) but more about building the deep core strength. This move can as the Hanging Arched Pull be done for reps or as a static hold although I would strongly recommend doing it for reps first before attempting to hold the position. I would also strongly recommend when starting out that you should not just attempt to do the Dragon Flag as Bruce is doing it above with both legs extended as it’s highly possible you could injure yourself. What I would recommend is doing negatives from the top down with our legs not fully extended until we build up our core strength. To start off you will need to have a pole or a bar of some sort behind your head, you will need to get used to rolling your hips up so they are above the shoulders. To do this you first tuck your knees into your chest, then roll the hips up, paying special attention to bearing the weight on the back of your shoulders and bringing your chin to your chest. From there we can either extend the legs partially so the hips are opened further but legs are still bent or perhaps fully extended but in a straddle or maybe one leg extended and one leg bent in. Squeeze your glute’s and contract your abdominals (think sucking in your belly and squeezing) and try to lower down to the floor gently over the course of 5-10 seconds and repeat. Over time you will eventually be able to fully extend both legs and lower and then after a period you will start to get the body awareness, core strength and mind to muscle activation required to be able to safely lift off from the floor in the full Dragon Flag position.